Has your hockey team ever been the top-seed in a tournament? How did you fare? Did your team look for new ways to improve their game? Or did you take your opponent lightly and play down to their level? The top-seeded team may have the most daunting task in a tournament, requiring greater mental toughness. Expectations are high for a top-seeded team and all the lower-seeds take more risks to dethrone the top-seed because they really have nothing to lose. In order for the top-seed to win, the team must focus on their game and seek new ways to raise the level of play. It’s an athlete’s “mental attitude” and a hockey team’s overall mental toughness that crucially affects his performance. Success is gained through the daily commitment to continual improvement and that includes the commitment to improve your mental toughness for hockey. 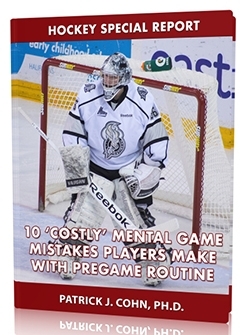 Mental toughness in hockey includes several mental attributes, such as confidence, focus, how your approach a game mentally, intensity, and desire. The Canadian Men’s hockey team entered the Sochi Olympic Games as the gold medal favorite. Prior to the Sochi Games, the Canadian team won the gold medal in hockey eight times, including two of the past three Olympics (2002, 2010). 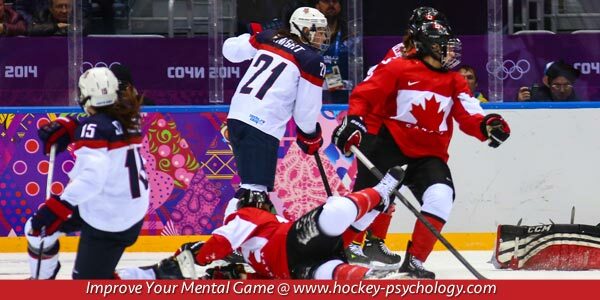 The Canadians responded to all the hype of being the top-seed with mental toughness. They produced one of the most dominant performances in recent Olympic hockey history convincingly winning the gold medal. The Canadian hockey team gave up a mere three goals throughout the tournament and recorded three shutouts. More impressively, no opposing team scored more than one goal against the Canadian team. The Canadian team did not trail at any point of the hockey tournament and became the first undefeated gold medal winners since 1984. The Sochi victory marked the first time Canada won gold in two straight Games since 1948 and 1952. You should seek to consistently get better despite who your opponent’s rank or your team being the favorite. Don’t take any opponent lightly. Remember, every game is an opportunity to push your abilities and hone your skills. Mental toughness in hockey means pushing yourself to perform at your peak no matter the level of dominance of your team. Don’t just scratch out the win, win big and dominate! Improve your mental toughness with one-on-one mental coaching with Dr. Cohn.